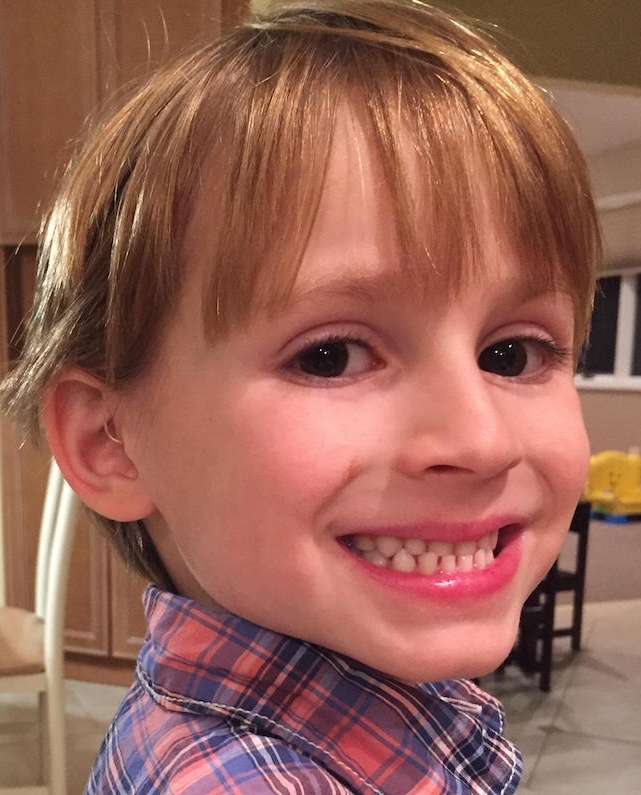 The future sounds clearer and looks brighter for Ethan, age 6, who recently began wearing ReSound LiNX 3D hearing aids recommended by his audiologist. His new hearing aids were very generously donated to him by ReSound. Ethan was born with mild-to-moderate hearing loss in his right ear and moderate hearing loss in his left. Thanks to universal newborn hearing screening legislation, an initiative promoted by Hearing Health Foundation and other organizations, Ethan was diagnosed at birth and able to receive immediate intervention. In 1993, only 5 percent of newborns were tested at birth for hearing loss; today 97 percent of babies are screened before they leave the hospital. Since age 6 weeks, Ethan has worn hearing aids and received speech therapy. He is now a happy first grader at a New Jersey school with many on-site services for students with hearing loss. Ethan is an older brother to twin girls, an avid self-taught reader, a math enthusiast, a soccer player, and a martial arts student. He is ecstatic that his new hearing aids have already improved his life; from the moment he put them on, he noted how much more easily he could hear with them compared with his previous pair. He especially appreciates their small size; the devices do not impede his favorite activities and don’t fall out. As Ethan is easily overwhelmed by noise, he also likes that he can seamlessly adjust the volume on his hearing aids through the ReSound Smart 3D smartphone app. He’s so proud of their style and features that he brags about them to his soccer teammates. “Ethan asked me, ‘Can I wear my new hearing aids for the next two million days?’” says Jason, Ethan’s dad. It speaks volumes to Ethan’s experience that he is ready to make a 5,500-year commitment to his new hearing aids. At a young age, he is already on track to overcome the challenges associated with hearing loss. Ethan is confident about his hearing loss, and he and his family are thankful he was graciously provided with hearing devices that make him happy. Ethan is one of our youngest participants in "Faces of Hearing Loss." This article originally appeared in the Winter 2018 issue of Hearing Health magazine.